HamiltonBuhl HA2USBSM Headsets - Headsets Direct, Inc. The HamiltonBuhl HA2USBSM dual-ear headset is a headband over-the-head style with speakers on both ears. This headset has an adjustable headband. That makes the HA2USBSM headset easy to fit almost any student. 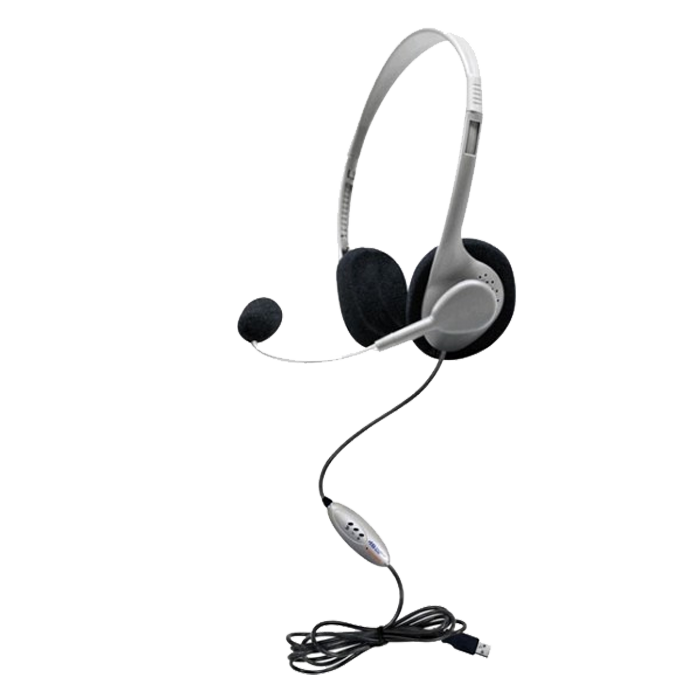 The headset also has a and a goose-neck microphone, so you can adjust the microphone to be right in front of your student’s mouth, so their voice will be clear and accurate. The wearing style is on ear, and on ear simply means the speakers and the foam cushions rest up against your ears versus around your ear. So this headset is made for the average-to-quiet environment. The HamiltonBuhl HW2USBSM headset comes with a 5-foot-long Dura-Cord that terminates in a USB plug. The Dura-Cord is a patented cord by HamiltonBuhl. It’s kink-resistant and chew-resistant. It’s a braided cord in a PVC sleeve, so very durable but still very flexible. This headset terminates in a USB plug, so you want to make sure that you’re using computers that have an available USB slot. The headset includes a disk, or you can download the latest drivers to get you up and going. That’s the one thing with USB, it’s plug and play, but it is better to have the latest software, so you may want to go to the HamiltonBuhl web page to find the latest drivers, so you get the most out of your headsets. There is a volume control inline on the cord, so the students can quickly adjust their speaker volume. This feature is particularly useful for students, as well as teachers, so the students can adjust the volume right on the headset and not have to mess with the settings on your PC and potentially change something else. This headset also comes with a storage bag that does dual purpose; you can write the students’ names on the bags, helping to keep the headsets and cords more organized, and it also acts as an anti-lice bag. All you do is put the headsets in the bag, and in 24 to 48 hours it will kill any lice, promoting a healthier classroom, without the use of chemicals. The HamiltonBuhl HA2USBSM headset is a good USB headset, simple plug-and-play with dual ear microphones. If you have any questions on this or any other headsets, please call us at Headsets Direct 1-800-914-7996, or visit us on-line at www.headsetsdirect.com.